Nearly 50 linear feet (about 150 titles) of periodicals supplement the book collection. Valuable holdings include California Southland/California Arts and Architecture, Land of Sunshine, Out West, and Pacific Monthly. 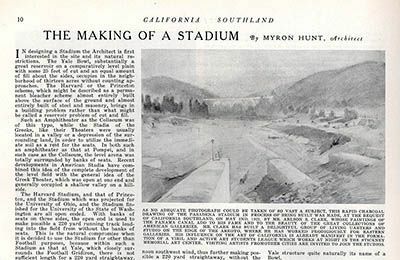 There are many locally published periodicals including Arroyo Monthly, Hotel Green Daily, Hotel Maryland Life, Pasadena Magazine, Pasadena Journal of Business, Pasadena Organization Directory (booklets for 1935-1964), and the Pasadenan.